Biden eulogized the late senator Thursday. 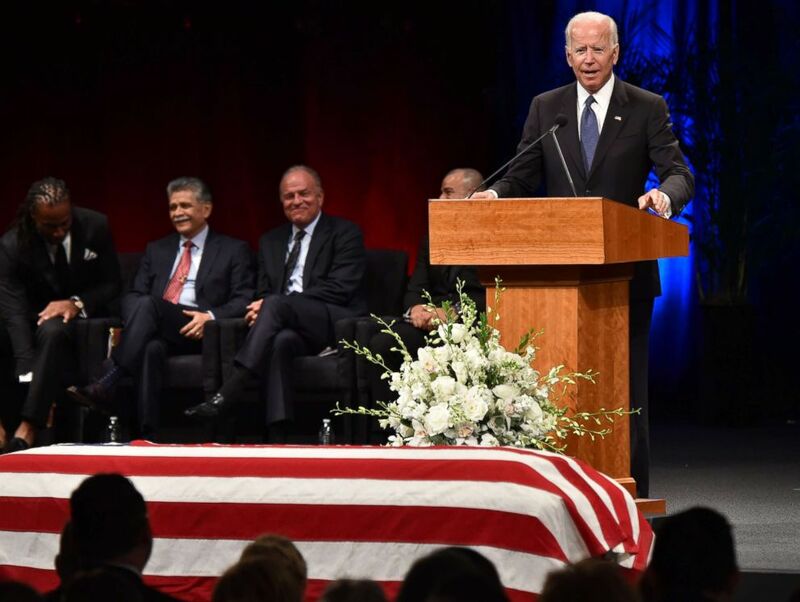 Former Vice President Joe Biden gave a tearful remembrance of his friend, John McCain at a memorial service in Phoenix Thursday, calling the late senator his "brother." "My name is Joe Biden. I'm a Democrat. And I loved John McCain," said Biden, who lost his son Beau to brain cancer, the disease that claimed McCain's life. "I always thought of John as a brother," he added. "We had a hell of a lot of family fights. We go back a long way." Biden headlined a half-dozen speakers at the memorial service at North Phoenix Baptist Church on the second of five days of events honoring McCain’s life. The ceremony was attended by nearly 30 of McCain’s Senate colleagues, both Democrats and Republicans. McCain died of brain cancer Saturday at age 81. (Robyn Beck/AFP/Getty Images) Former Vice President Joe Biden speaks during the memorial service for the late Senator John McCain at the North Phoenix Baptist Church, Aug. 30, 2018, in Phoenix. “All politics is personal. It's all about trust. I trusted John with my life and I would and I think he would trust me with his,” Biden said. “There are times when life can be so cruel, pain so blinding it's hard to see anything else,” Biden said, referring to the death of Sen. Ted Kennedy who died in 2009 and his own son, Beau, who died in 2015. Both men suffered from same brain cancer that took McCain’s life. “It's brutal. It's relentless. It's unforgiving. It takes so much from those we love and from the families who love them that in order to survive, we have to remember how they lived, not how they died,” Biden said. In a powerful moment, Biden lamented the lack of bipartisanship in today’s political climate – turning to his left on stage and speaking directly to a group of senators who were present for McCain’s service. “The last day John was on the Senate floor, what was he fighting to do?” Biden said, referring to McCain's final floor speech in July 2017 ahead of his iconic decision to tank the Republican-led effort to repeal and replace the Affordable Care Act. "But the truth is, John's code was ageless — is ageless,” Biden said. "John's story is the American story, that's not hyperbole. It's the American story. Grounded in respect and decency, basic fairness. The intolerance for the abuse of power," Biden added.